discharge conditions of 374 cfs recorded during the drought of 1966 and 483,802 cfs recorded during the flood of 1936 (MWCOG, 1989). The long-term (1931-1988) mean 7-day, 10-year low flow (7Q10) at Little Falls is 628 cfs. Low-flow conditions typically occur from July through September, with the minimum monthly flow of 4,126 cfs recorded during September (Figure 8-3). 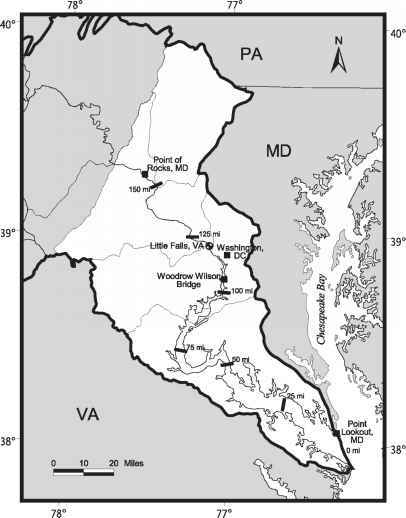 The long-term (1951-1980) mean summer (July-September) flow for the Potomac River at Little Falls was 4,428 cfs (Figure 8-4).